Fear the Roo(s).... Normally shopping for school shoes would never be the reason for a post, however, this is the Jones family!! So in true Jones fashion, we go shopping for the all important tennis shoes to begin Kindergarten. I look for the ones with the coolest colors and Wade goes for the tried and true faithfuls. He tries to get Abs to get some old school K-Swiss. Please note: There is nothing wrong with the K-Swiss but he gets all senitmental about having them when we was in school. So after we weren't sold, we go to eat dinner with the whole Jones clan. I merely make the statement about the K-Swiss and we all laugh...I then add "If Wade could find a pair of Kangaroos, that's what he would have Abs in!" (Do you remember the Kangaroos? The ones with the zippers on the sides to keep your ice cream money?) There was much laughter and Wade wasn't very happy with us! Remember - paybacks are fun!!! Wade got his payback on all of us!!! 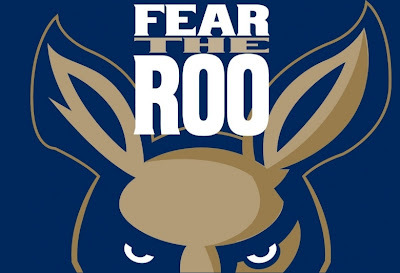 And remember - "FEAR THE ROO(S)!!" Too cute. This story made me laugh Saturday night, and it's still funny. Abs is all ready for school. They look darling on her! Have a blast at your first day of school Abigail! I HAD KANGAROO'S!!!! I would never have thought that they would be back...awwww....nostalgia!! I had baby blue Kangaroos and never could get all the snack money out. Wonder why I didn't just take my shoe off? Love them! Have fun at kindergarten Abigail!!! I don't remember those??? I must have blocked it...course i am a "little" older than you guys. Those are cute! Have fun at school Abs!! I remember those! 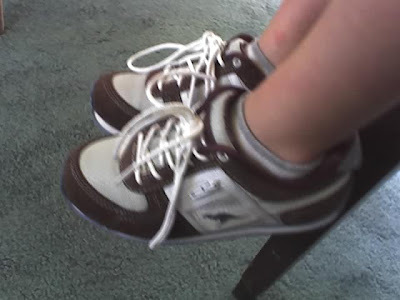 I had a pair but I don't remember what color they were - too long ago!! They look totally cool Abs! !